This surveillance system allows you to install up to 4 wireless cameras to digitally record all activity. This DVR has full networking capability and uses an embedded DVR which allows you to view live video on the Internet. 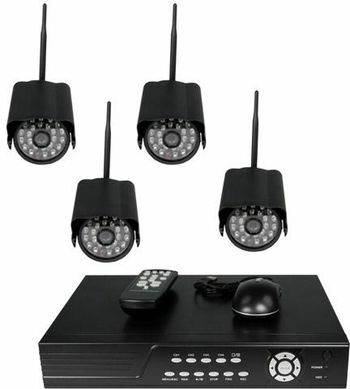 This 2.4 GHz Digital Wireless 4 Channel - H.264 DVR System has network function and uses MPEG4 and H.264 compression design. Its wireless camera has 24 IR LEDs for night vision, and its wireless DVR is designed for mixed use wired and wireless interface. Has a graphical interface and supports 3G Mobile Phones surveillance and E-mail function. Backup file supports windows media player. This is a new and improved system that has really impressed all of us at GLC Enterprises, Inc.. There have been issues of interference in the past from wireless Internet when using wireless systems. Not with this system. There is NO INTERFERENCE. The wireless cameras are on their own frequency and you get a strong signal which gives you amazing video. You can also Use 3G Smart Phone like iPhone, Android to view live video surveillance and the complete system is very easy to hook up. If you need assistance, our techs are standing by to assist you. Playback Method= Normal Play, Fast Forward, Rewind, Single step. (1) Stand Alone 4 channel DVR.